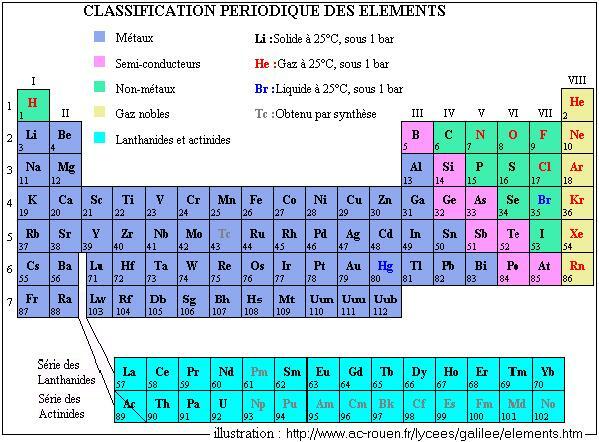 The periodic classification of the elements was carried out in 1869 by Mendeleïev. 69 elements were known, and Mendeleïev had left in its table of the empty boxes corresponding to elements which according to him would be one day discovered, which was indeed carried out. The first problem encountered by Mendeleïev is the fact that the existence of the isotopes returns classification by difficult atomic mass. However, it used this classification, which was preserved until 1913. It is thanks to the physicist Moseley (researchs on the spectra of x-rays) that one adopted the classification per atomic number (Z) : this one increases with the periods (or lines) and decreases with the columns, lines and columns being reversed in the origin table. The current table, imposed by the International Union of Pure and Applied Chemistry, and universally used, contents 18 columns (correspondent with groups of elements), that is to say about a hundred elements. New elements are sometimes found (artificial elements). The list is updated by the IUPAC and can be consulted on its site : http://www.iupac.org. The two most known groups are the groups three to six of columns 2 and 3 (essential elements for the life like carbon C, nitrogenizes N, oxygen O, etc, components of the earth's crust and the atmosphere and the alkaline ones like sodium Na) as well as the group 18 (rare gases : helium He, argon Ar, neon Ne, ...). The names of the elements are often due to their properties or their discovery : hydrogen allows the synthesis of water, phosphorus brings the light, francium (Fr, Z = 87) was discovered in France. The elements of Z = 101 with Z = 103, are respectively called Fermium, Mendélévium and nobelium. Many elements have several isotopes. Two isotopes are two atoms whose cores have the same number of protons (Z), but not the same number of neutrons. The isotopes are named by the name of the principal element corresponding to the value of Z, follow-up of the number of nucleon (nucleon is a general name for proton and neutron) One has for example carbon 12 (6 protons + 6 neutrons) and carbon 14 (6 protons + 8 neutrons). The existence of the isotopes makes it possible to the scientists to calculate the age of the alive beings (see framed 1). Certain cores can disintegrate (naturally or by a contribution of energy by the human one) : it is the radioactivity. The iron core is most stable of all, it does not give place to any nuclear reaction. The too heavy cores, i.e. whose Z exceeds the value of Z for iron, are unstable and tend to disintegrate to generate several lighter cores. One speaks then about nuclear fission : Uranium 238 gives lead 206. The too light cores have them tendency to react between them to give heavier cores. One speaks in this case about nuclear fusion : carbon-14 gives the nitrogen 14. These reactions are at the base of the nuclear engineering, that it is civil (power stations), soldier (bombs A or H, see The bomb H and the Nobel) or even medical (IRM), but also make it possible to carry out datings (see framed 2).